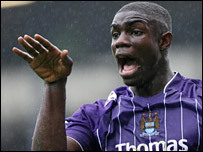 Micah Richards' contract talks with Manchester City are progressing well, according to the England star's agent. Richards, 19, has been in impressive form for club and country and hopes to agree new and improved terms despite being under contract until 2010. Alex Levack told BBC Sport: "Talks were on hold while Micah's father and I were away but they resumed this week. "Talks are ongoing and going well. Micah's football takes precedence but we hope to get something signed soon." Last month, Richards told BBC Sport he was keen to sign a new deal, saying: "I am very happy at City. He added: "Hopefully we will have something signed in the near future. "To me, the most important thing now for my England chances with Euro 2008 coming up is to be playing week-in week-week out. "If I am at City then I am hopefully going to be doing that, so it will be the best thing for me."